This photo presented an opportunity compare a similar current view. 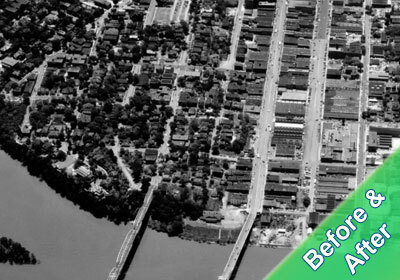 Click image below to see the before/after page for the downtown portion of this image. Aerial view of Chattanooga looking south from North Chattanooga across the Tennessee River and South to M. L. King Jr. Blvd. (9th Street) Probably taken by International Airfotos of Nashville, TN. Centered over the river, this photo shows the undeveloped state of both sides of the river. There is no Tennessee Aquarium, and no 'North Shore'. 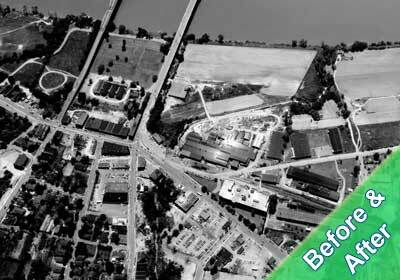 The West Side Renewal Project was about to change the face of Chattanooga forever, moving railroad tracks, and leveling Cameron Hill. The Interstate Highway System would soon come to the city. A third bridge, the Olgiatti, would cap off these efforts, named for the mayor that spearheaded them.